Silver Investment News: QE3 Discussion "Will Push Gold Prices Higher", Eurozone Problems "Have Not Disappeared"
QE3 Discussion "Will Push Gold Prices Higher", Eurozone Problems "Have Not Disappeared"
Gold Prices traded just above $1660 per ounce Tuesday morning in London, a few Dollars down on last week's close, while stocks and commodities were also broadly flat on the day and US Treasuries gained. Silver Prices rallied to nearly $31 per ounce, having fallen back through that level a day earlier, before easing back towards lunchtime. "Although in an uptrend, gold does not appear as technically strong as silver," reckon technical analysts at Scotia Mocatta, a bullion bank. On the currency markets, the Euro climbed back above $1.25, having dropped below that level during Tuesday's Asian trading, with analysts continuing to speculate on the prospects for a third round of quantitative easing (QE3) from the Federal Reserve. Over the weekend, the leaders of France and Germany, the Eurozone's two largest economies, both said they wish to see Greece remain in the Euro. "For me, the question should no longer be asked," said French president Francois Hollande, following Saturday's meeting with Greek prime minister Antonis Samaras. "Greece is in the Eurozone." "I want Greece to remain a part of the Eurozone," said German chancellor Angela Merkel a day earlier. "We expect from Greece that the promises that were made are implemented, that actions follow words." Greece is asking for a two-year extension to meet its commitments to austerity measures, and has proposed issuing short-term T-bills to cover the estimated €18 billion funding gap this would create. Representatives of the 'troika' of lenders – the European Central Bank, European Commission and International Monetary Fund – are due to visit Greece next month to report on the government's progress towards its commitments, although their report may not be published until October, a Commission spokesman said Monday. "It's not in German interests to kick Greece out of the Eurozone," says ING economist Carsten Brzeski in Brussels, speaking to Bloomberg. "Everyone realizes that it's in the German interest to solve the crisis. At the same time, [Germany has] become weak enough to show them that they're not an economic island anymore." "The Eurozone has been quiet of late, but that doesn't mean the problems have disappeared," adds Jeffrey Rhodes, global head of precious metals at INTL FCStone. "The US economy has been sluggish and there is a growing belief that there is going to be QE3 soon. This anticipation is driving the market." "We expect the Fed to ease policy further in September," agrees Steve Barrow, head of G10 research at Standard Bank, adding that easing could take one of various forms, such as QE, cutting rates interest rates on banks' excess reserves, or extending the length of time the Fed says it expects rates to stay at historic lows. Fed chairman Ben Bernanke is due on Friday to give a speech on 'Monetary Policy Since the Crisis' at the annual Jackson Hole conference of central bankers. It was at this even two years ago that Bernanke hinted at a second round of quantitative easing, which the Fed implemented a few weeks later. "We expect there to be QE3 by September and gold will move substantially higher," says Philip Klapwijk, global head of metals analytics at consultancy Thomson Reuters GFMS. "More cash is coming into the market from investors...ETF demand has picked up and will continue to grow as prices rise." Last week saw the world's largest Gold ETF, the SPDR Gold Trust (GLD), add nearly 12 tonnes of Gold Bullion, taking the total to 1286.5 tonnes, the highest level since April. On New York's Comex meantime the difference between bullish and bearish contracts held by Gold Futures and options traders – known as the speculative net long position – jumped by nearly a fifth in the week ended last Tuesday, according to weekly data published by the Commodity Futures Trading Commission. Russia's central bank added 18.6 tonnes of gold to its reserves in July, according to IMF data published last week. Kazakhstan, Kyrgyz Republic and Ukraine also opted to Buy Gold, while Guatemala and Mexico reduced their holdings. Turkey, whose reported official reserves includes gold held at the central bank by commercial banks, saw its gold reserves grow by 18% in July, the IMF data show. "There's a lot of talk of gold coming back as a safe-haven asset," says Bernard Sin, head of currency and metal trading at Swiss refiner MKS. 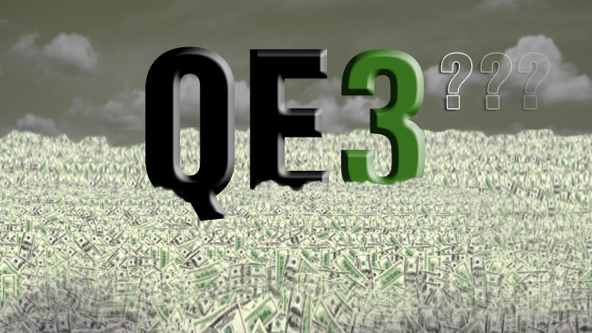 "As long as the QE3 discussion is on the table, gold will continue to trade higher."